The term root is rather cryptic. It doesn’t really convey the essence of what the process entails and the benefits it confers. iOS users have a better name: jailbreaking. How to root an Android device is the same as jailbreaking an iPhone and iPad. The risks associated are similar and the pay-offs equally tantalizing. So what exactly is “rooting”? The answer depends on why you want to root your device, your technical skills and the way you perceive the rooting process. Android Operating Systems (OS) are developed on the Linux platform. The files and organization of your Android phone or tablet elements mimics that of the typical Linux environment. Now when you purchase a device, by default, you are assigned limited user permissions. Based on these rights, you can access developer options, delete applications, and customize the look and feel of your phone. For some people, the default settings work just fine. In fact, they never get around to using all their Android device’s features and functionalities. But if you have privileges like the ability to flash an ROM, store and overclock (or underclock) the processor in mind, then you have to be a “superuser” who can go anywhere and in essence unlock the potential of the software to the fullest extent. Void the warranty – Google is no longer responsible for how your platform functions. Expose yourself to threats – Google doesn’t handle your security any more. You do. Stand to lose your data if the operation doesn’t go through as expected. Individuals who must remove bloatware that slows down the machine and peppers them with unwanted notifications vote in favor of applying a root. After all, since they have paid for the hardware and the software, they are entitled to enjoy a rewarding experience. Others who are more interested in light social browsing and think highly of the sanctity of a Google maintained OS steer clear of rooting. Irrespective of the category to which you belong, here are simple, clear and to the point instructions to root your device. You will need a commercial rooting application to undertake the process. 1. First, create a backup of your entire phone. 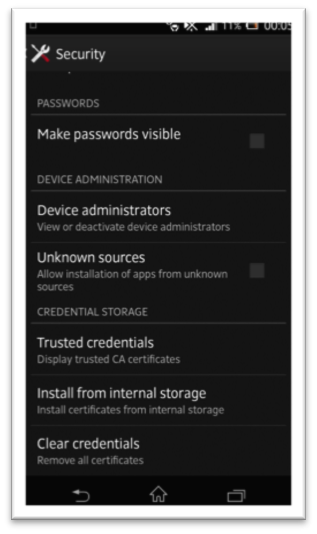 Take a snapshot of the data as well as the app settings because you might lose everything if the rooting is a failure. 2. Next you need to activate the USB Debugging mode so that you have system level clearance without which rooting is impossible. To do this, visit Developer Options in your Settings menu and tick the checkbox next to “USB Debugging”. 3. Now head over to Security and under Device Administration, tick the option “Unknown Sources” so that you can install the root app which is a third party creation. Incidentally, the Google Play Store doesn’t really have a robust root solution because the brand doesn’t want to encourage the violation of the warranty of your device. 4. Once the basics have been taken care of, switch on the Wi-Fi or your carrier data and visit the root application website. Download, install and run the piece of software. Each wizard has its own set of instructions and most of it are self-explanatory. Just bear in mind that disrupting the root application has disastrous consequences. Do allow the process to complete and refrain from fiddling with the phone when the rooting is underway. 5. If you want to check the success of the root application, you can do that with the Root Checker app or any other variant available in the Play Store. Do you regularly use sensitive services like Google Wallet that has your credit or debit details? You should upgrade to a very powerful anti-virus and anti-phishing software solution to protect your money! A rooted device can turn a ton of tricks. There are some mindboggling applications that you can leverage to do more than your peers can dream possible if you know how to root an Android device. But the downside is the vulnerability of your Android. It is exposed to malware and bricking (in which case it is essentially as useful as a brick and won’t turn on in any way, shape or form). You can unroot your device too by removing the SU (Switch User) file that gives you root or highest level permissions. But everything must be done with care and using the right tools so that your Android’s capabilities are enhanced without adversely impacting your investment in the software.